본 교재는 캐나다 현지 교과과정에서 사용되고 있는 교재로서 영어에 입문하는 학생들에게 영어의 근간이 되는 기초문법을 형성시키는데 촛점을 맞춘 교재입니다. 캐나다 전국에 걸쳐서 수많은 학교에서 이미 많이 사용되고있는 매우 훌륭한 교재입니다. 각 레벨별 총 80페이지로 제작되었습니다. 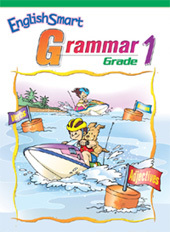 I recently bought your series of EnglishSmart Grammar activity book at Costco and I find they are fantastic. I am very impressed with the grammar book. I am a teacher of an Intensive support class and I think my students would find these pages much more interesting to do. These books worked very well with the English students I am tutoring.